"Irish Soda Bread for the bread machine. 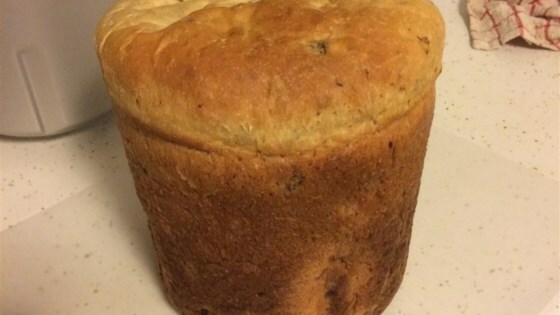 This recipe makes a wonderfully tasty loaf." Add ingredients in order suggested by your manufacturer. Select fruit bread or basic bread setting. Add raisins when indicated by your manufacturer. delicious, soft-type irish bread. will make it often! having eatan soda bread as a youngester in belfast, i found this bread lacking. Easy to put together in bread machine. I baked it in the oven at 350 degrees for 30 minutes in a greased loaf pan. Very good! Can't give it full stars because, good bread it may be, but it is not soda bread. Soda bread is supposed to be leavened only with baking soda, that's why they call it soda bread!!! A real tasty bread. My wife says "It sorta grows on you."